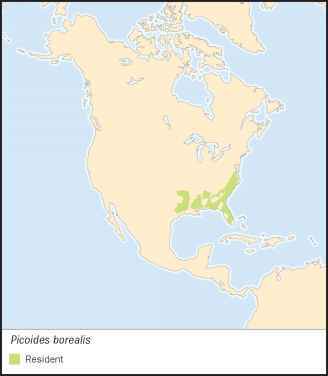 Picus borealis Vieillot, 1807, North America (specific locality unknown, but arbitrarily decided to be Mount Pleasant, South Carolina). 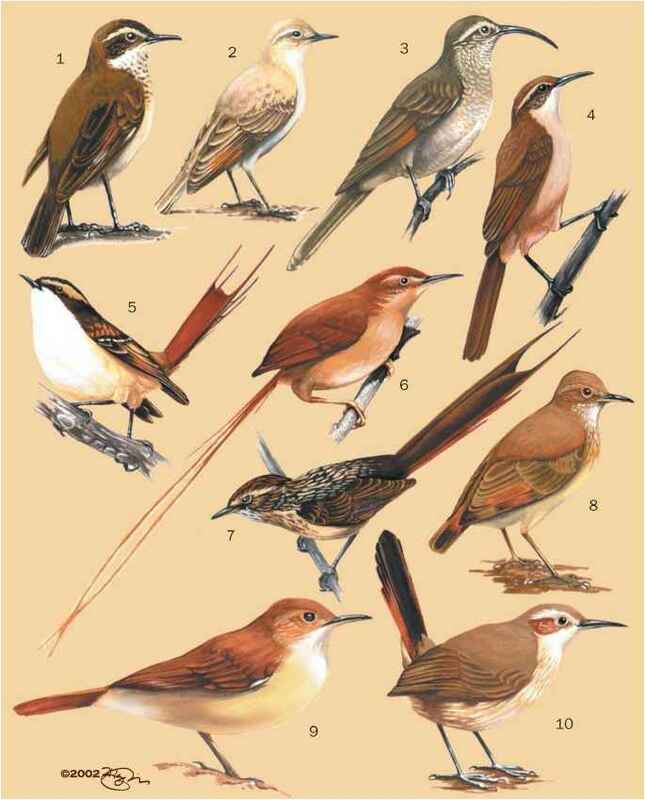 Two subspecies described, Picoides borealis borealis from most of the species range, and P. b. hylonomus from central and southern Florida. Researchers have discounted the latter race in the late twentieth century. French: Pic boreal; German: Kokardenspecht; Spanish: Carpintero de Cresta Roja. crown, but the red is usually concealed; females lack the red; immature males may have irregular red patch on forehead, immature females tend to have white flecks on lower forehead. Southeastern Oklahoma and eastern Texas, southern Missouri, south central Kentucky, central Tennessee, to southeastern Maryland, south to southern Florida and across the Gulf coast. Now extirpated from Missouri, Kentucky, Tennessee, and Maryland. Vagrants have shown up as far north as Illinois and New Jersey. Extensive, open, old-growth pine forest, naturally maintained by lightning-started fires. The red-cockaded woodpecker is a very social species that lives in extended family groups including one breeding pair, their offspring from recent nesting efforts, and males from earlier nesting efforts. The group forages over an area averaging about 200 acres (80 ha) in good habitat and more than 1,000 acres (400 ha) in poor habitat. Cavities are in living pines, usually below the lowest branch, in trees infected with the red-heart fungus. Cavities persist sometimes for decades and are used multiple years as nest and roost sites, inherited by males who remain with the group. Birds peck tiny holes, called resin wells, above and below each cavity. These are continually worked so they provide a steady flow of sticky resin, which is an effective barrier against tree-climbing rat snakes (Elaphe). Feeds primarily on tree-surface arthropods obtained from the surface and by scaling loose bark from the tree. Males tend to forage mostly on limbs and trunk of pines above the lowest branch, females on the trunk below the lowest branch. Monogamous, but a cooperative breeder; nest is in the roost cavity of the breeding male. Clutch size typically 2-5 eggs; incubation period 10-11 days; young fledge at 26-29 days; offspring cared for by both parents and helpers. Vulnerable, and listed as Endangered under the U.S. Endangered Species Act; populations have suffered from habitat fragmentation and deforestation, cutting of old-growth pine forests, and control of natural fire.